Spidey and Don are a cat wrangling tag team that sprinkle BowieWonderworld with fairy dust and other assorted happy thoughts. It is quite possible that they are distantly related to Susans and Spaceface, in part due to the fact they are just such swell people. Spidey is often referred to as "Queen Beanie Baby" as she is a fanatic collector of toys with beans in them. A lesser-known nick is "Queen Wee," which she is only called when she's drinking beer and chatting. Hubby Don is regularly mistaken for Tom Cruise, especially when showing photographs from his 1977 Low period. Spidey had the genius and foresight to wear a BowieWonderworld T-shirt live on the set at BBC television during db's performance on the Jools Holland Show. Spidey we should bow down in your presence for his courageous act and total abandon. You are therefore duly honoured with the presigious title of 'Dame Spidey'. We salute you, and all that sail in you. Spidey - Sweet Thing (Candidate) Sweet Thing Reprise. Don - Word On Wing. Spidey: I've only ever been to one real life Auction, it was all Cat Stuff btw, anyhoo...... I made a bid for some cat books or somesuch (about £10) and the bloke with the hammer said "Who'll give me 12 quid?" and I put me hand up again...... He then said "Very good madam, BUT do you realise you're bidding against yourself?"!!!!!!!!!!!!!!!!!!!!!!!!!! EVERYBODY in the room turned and looked at me!!!! EEEEEEKK! Astoria and BBC Radio Theatre. 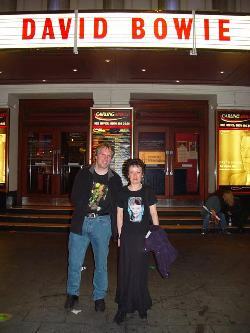 UK BowieNet Bash Party.... Hammersmith, London, 9th October 1999. Intolerance (we both picked the same word).